In 1976, Holocaust revisionism produced its last "standard work," if there ever was such a thing: A.R. Butz' Hoax of the Twentieth Century. "How can a quarter century old text not be obsolete today?" Butz asks in the preface of the 2003 edition of his own book, pointing out "the age of this text, and the great advances that have subsequently occurred in Holocaust revisionism." Hence, there is a great need for a new, integrated work summarizing Holocaust revisionism after 30 years of very intensive and thorough research. And here it is, the new standard work of Holocaust revisionism! It was written by German scholar, writer, and publisher Germar Rudolf, based on the research of the most prominent revisionists, most of which Rudolf had the pleasure to publish in a multitude of German and English language journal articles and books since the late 1990s. 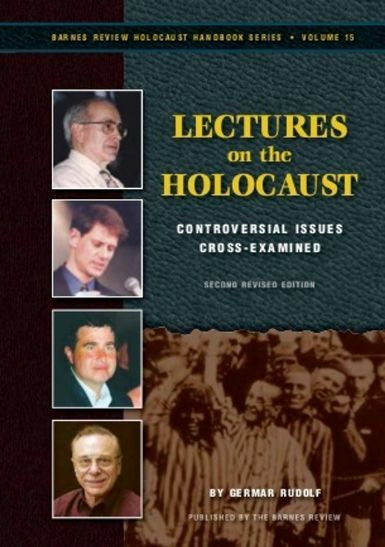 The book was written to fit the need of both those who have no in-depth knowledge of the Holocaust or of revisionism, as well as for well-versed readers familiar with revisionism. Anyone who wants to bring himself up to date on revisionist scholarship, but does not want to read all the special studies that have been published during the past twenty years, needs this book! From 1992 to 2005, Rudolf has been giving lectures to various audiences all over the world. His topic is very controversial: the Holocaust in the light of new forensic and historical findings. Rudolf's sometimes astounding facts and arguments fall on fertile soil among his listeners, as they are presented in a very sensitive and scholarly way. This book is the literary version of Rudolf's lectures, enriched with the most recent findings of historiography. The book's style is unique as is ist topic: It is a dialogue between the lecturer and the reactions of the audience. Rudolf introduces the most important arguments and counter arguments of Holocaust revisionism. The audience reacts with supportive, skeptical, and also hostile questions. The Lectures read like a vivid and exciting real-life exchange between persons of various points of view. The usual moral, political, and pseudo-scientific arguments against revisionism are addressed and refuted. This book resembles an entertaining collection of answers to frequently asked questions on the Holocaust. With more than 1,300 references to sources and a vast bibliography, this easy-to-understand book is the best introduction into this taboo topic for both readers unfamiliar with the topic and for those wanting to know more. Second, updated and corrected edition, edited by Prof. Dr. Thomas Dalton, author of Debating the Holocaust.